This article includes the best small cooler reviews currently available. When choosing small coolers to review, we considered their capacity, materials and insulation capacity, comfort while carrying them, usability, and ratings and reviews from verified customers. 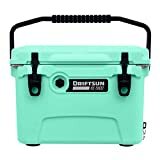 We selected items from manufacturers like Coleman, Igloo, Rubbermaid, Arctic Zone, and other brands that are well-known for their high-quality and long-lasting cooler products. The Igloo Quantum 12 Cooler is a hard, durable cooler that is 12.5 inches long, 11.5 inches wide, and 12.5 inches high. It can hold eighteen cans of soda or nine long-neck bottles standing up. This Igloo cooler features a lid with self-draining cup holders and a secret compartment that can fit a wallet or can cozies. It can also be locked using one or two padlocks that are not included. Additonally, the back of the Igloo Quantum 12 cooler is curved to make carrying it a little more ergonomic. According to online reviews from verified customers, some had difficulty with ice melting too quickly; however, others remedied this issue by using frozen water bottles to keep the contents cold. LEAKPROOF - Heavy grade, thick, puncture resistant food safe liner- HEAT SEALED to prevent leaks. The Arctic Zone Titan zipperless cooler is a soft body cooler with a lid that closes with a tight Velcro seal rather than a zipper. It is 12 inches long, 8 inches wide, and 12 inches tall. It features hard liner that allows the cooler to keep its shape and comes in three sizes: 16, 30, or 48 cans. This liner of the Arctic Zone Titan zipperless cooler has a removable shelf which enables you to keep soft items above and separate from hard cans. The shoulder strap is adjustable and includes a shoulder pad to reduce fatigue and stress. The insulation of the Deep Freeze cooler will keep ice frozen for about twelve hours. This and the removable shelf make the zipperless Arctic Zone cooler the cooler for packing lunch and drinks for one. The 5-quart Rubbermaid cooler is a great size for carrying lunch or a six-pack with ice. It is a hard-sided cooler that is 10.5 inches long, 7.4 inches wide, and 8 inches high. 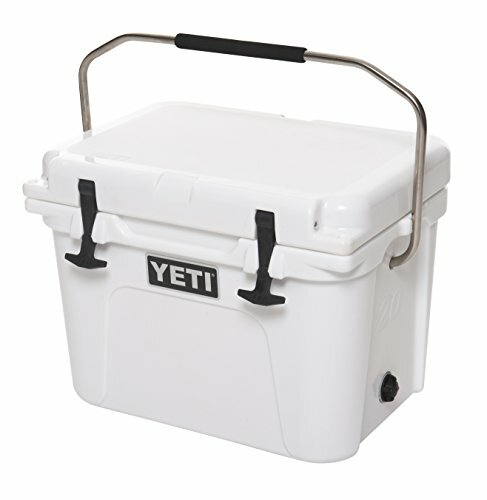 This cooler features a swinging handle that makes it easier to carry than others. It also features superior thermal retention, keeping contents cold for hours. In addition, this cooler has a stain- and odor-resistant lining that is easy to clean. Some customers who wrote Rubbermaid cooler reviews appreciate the insulation capabilities of this small cooler, while others love that it’s made in the USA. The Coleman 9-Can Cooler is a soft-body cooler with a hard, removable liner. It is 9.5 inches long, 6.5 inches wide, and 10.25 inches tall and features front and side pockets in addition to the main cooler. In addition, it is also has bungee straps on top that can hold a 2-liter bottle. The shoulder strap is adjustable so it can also work as a handle. The Coleman 9 can soft cooler with hardliner can keep contents cold for 8 to 10 hours; in addition, the liner is removable and made of antimicrobial materials. This is a great cooler for daily use and is, in our opinion, one of the best coolers for hiking alone or the best personal lunch cooler available for purchase in 2018. The 10-quart Rubbermaid Cooler is 10.5 inches long, 13.4 inches wide, and 9 inches high. It is a hard-body cooler that can hold twelve cans plus ice. It has a swing handle that is okay to carry for short distances, and the insulation is efficient and will keep contents cold for up to two days. 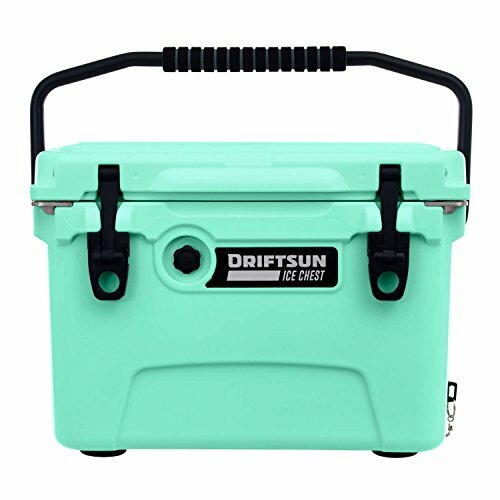 This is a great cooler for road trips or camping. It is tough and durable and will take some abuse. In our reviews, this is one of the best hard-body coolers. 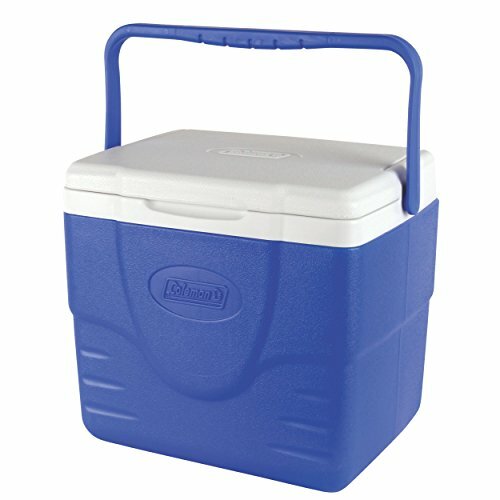 The Coleman FlipLid 5-quart cooler is a great small cooler for a trip to the beach. It is a hard-body cooler that measures 8.25 inches long, 7 inches wide, and 10.5 inches high. It is just the right size to hold a six-pack and some ice. Customers appreciate the craftsmanship of this cooler, specifically that when you fully open the lid, it stays solidly open, revealing cup holders and a space that can be used as a small table. The insulation of this cooler keeps ice frozen solid for six to seven hours, which makes it one of the best ice chest coolers on the market. If you are looking for a small cooler to pack ice cubes, you might also be interested in the best ice scoops available on the market this year! The 16-quart Coleman Personal Wheeled Cooler is the only wheeled cooler on our list. 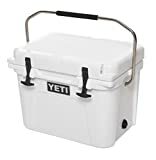 At sixteen quarts it qualifies as a small cooler but comes with the extra maneuverability of a long handle and wheels. It’s 10.75 inches long, 15 inches wide, and 15 inches tall, which means it can hold up to 22 cans or 11 beer or water bottles. It has very efficient insulation which keeps the contents cold for up to two days. This is a great option for weekend trips or anywhere you will walk to your destination. In our reviews, this wins best wheeled small cooler. Planning a longer summer camping trip? Make sure you also go through our collection of the best portable ice makers on the market in 2018! 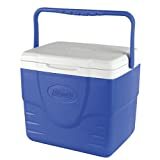 The Coleman 9-quart excursion cooler is a hard-body cooler that can hold nine cans or six bottles of water/beer with extra room for ice or a couple of sandwiches. It is 12.9 inches long, 11.3 inches wide, and 9.3 inches high. 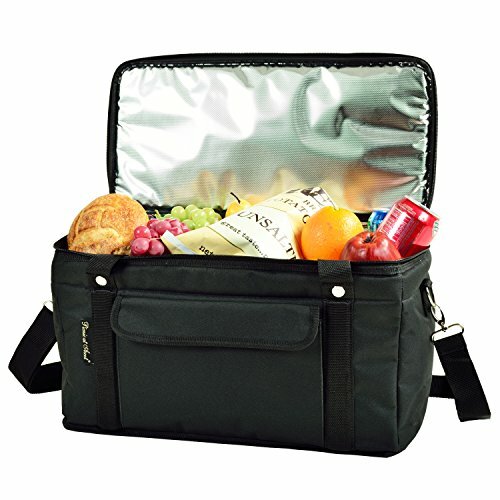 This is a great option for a lunch box, or to take a six pack and some snacks for a day trip. 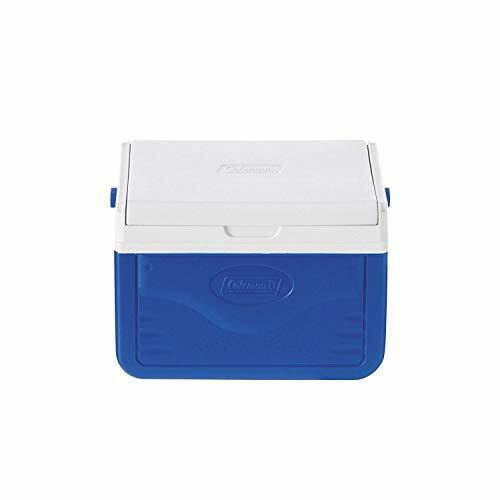 The insulation of this Coleman 9-quart cooler holds heat out for about 8 hours and the bail handle makes it easy to carry by both right- and left-handed customers. 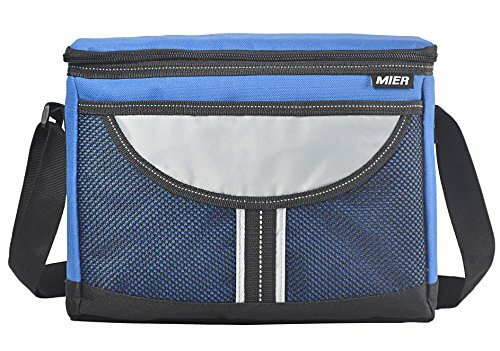 The Mier insulated lunch box is a soft-sided cooler that measures 12 inches long, 6 inches wide, and 9 inches high. It is large enough to hold sixteen cans of soda or 8 beer bottles; in addition, its soft sides allow it to collapse for easier storage. The zipper operates smoothly and can be secured with a luggage lock. According to the manufacturer, the seams are heat welded and its interior lining is leakproof. The shoulder strap of this Mier soft cooler bag is adjustable from 9 to 19 inches, which enables both hand- and shoulder-carrying. The Fit & Fresh cooler bag has a capacity of 6 soda or beer cans and measures 9 x 8.75 x 6.5 inches. It also comes with an adjustable side pocket and a zippered front one for storing other drinks or valuables. 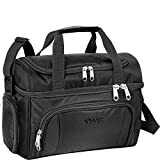 In addition, this cooler bag also comes with an adjustable and detachable shoulder strap and reinforced handles that ensure it will be a long-lasting small cooler. Firstly, this awesome backpack cooler chair from Sornean is ultra lightweight and durable according to the manufacturer and customer reviews. In fact, it’s the third reviews according to our research. Additionally, it’s made of high-quality waterproof oxford fabric and only weighs 6 pounds. 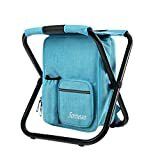 In addition, this cooler/chair/backpack combo also features lots of pockets and can fold down neatly for storage in other travel bags if needed. Thus, customers mention the weight limit for the chair is 250 pounds, making it a very sturdy and reliable option. Firstly, the eBags Crew Cooler was originally created for flight attendants and pilots. Secondly, its greatest features include the many different compartments, pouches, and different-sized pockets. Thirdly, it also has a pass-through sleeve on the back so that it can slide over the handle on rolling luggage. It is 10 inches long, 14 inches wide, and 10.5 inches high. Only the bottom compartment is a cooler, as the upper compartment, side pockets, and front compartment are not lined with insulation. Furthermore, the eBags Crew Cooler II is soft-sided and can collapse for compact storage. In addition, the liner of the cooler compartment is removable and can be replaced if damaged or taken away for cleaning. In our reviews, this wins best cooler for travel. In addition, it comes in 8 attractive and modern colors so you will definitely find one that you will love! This 12-can soft cooler bag from Lifewit is one of the best bags today, made of durable 1680D water-resistant dirt-proof Oxford fabric. Moreover, the inside features food grade aluminum foil and 8mm EPE foam to ensure thermal resistance. It’s an ideal option for storing food and maintaining your drinks cold for school, workplace, and pretty much everywhere else. Additionally, the design of this cooler bag allows you to wear it as a crossbody, shoulder bag or handbag, as it features a padded handle and a detachable/adjustable shoulder strap. At 7.9 x 7.9 x 9.8 inches, this option from Lifewit is small enough to be easily carried everywhere and accommodating enough to fit your everyday needs. 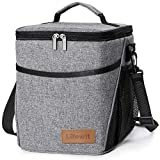 In conclusion, our verdict for best small cooler overall goes to the eBags crew cooler and Lifewit soft cooler bag considering ratings and reviews from verified customers. Additionally, they’re ideal for those who travel a lot and don’t need all of their items cool. However, Coleman and Rubbermaid also make high-quality, long-lasting small coolers. What do you think? Feel free to share your thoughts, experience, and/or questions with us! Arctic Zone is a great make and I like my small cooler. I like the velcro fastener instead of the zipper one since that gets caught quite often and becomes a big inconvenience. The bonus is that the price is not all that bad either for this. Thank you for your feedback! We agree, this product has some nice features, which is why it’s on our list of best small coolers. 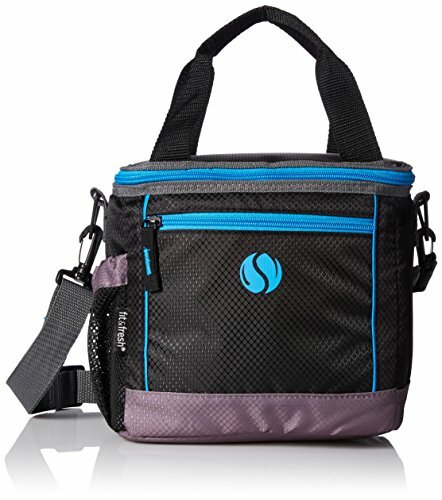 The eBags Crew Cooler is a good small cooler. That is the only one that I have had and I am glad that you don’t have to be a pilot or a flight attendant to own one. They are good for anyone. Thanks a lot for the feedback. We’re glad you loved our picks. Thank you for your comment, Tania! Looks like it’s time to plan a holiday by the beach! We are happy to hear you are pleased with this cooler, we are sure our readers will find the information useful. 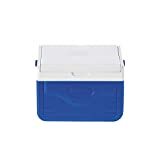 I used my Igloo Quantum 12 Cooler when our family went on picnics during the summer, and I thought it was adequate as the food and drinks were kept cold, and space as well as pretty good. That is my experience with it. Hi, Fran! Thank you for your feedback! 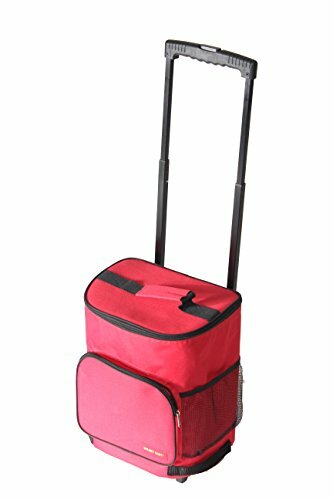 The Coleman Excursion Cooler is the one that I would recommend because it is so roomy you can add more food into it than you had thought. That means if you have leftovers that you had gotten from a friend at the picnic, then you can take it home and it will stay good. That’s great to hear! Thanks for your input. Yep, Rubbermaid is a good cooler. I take mine whenever it is a picnic day. Because summer has ended, we will be putting ours away for a while. But this cooler is decent enough as it keeps the food and drinks cool whenever we have a picnic. Hi, Faith! Thank you for sharing your opinion on the Rubbermaid cooler. My thoughts are that Rubbermaid is a fantastic make and they also make the best coolers. They are durable and will last you a very long time. I can’t comment on the others around, but this is what I know. Hi, Steve! Thank you for sharing your personal experience with this cooler. Igloo definitely makes good quality small coolers, and they are just a good make as it is. I like mine because my food and drinks always stay fresh no matter how long they are left in the cooler. It does a great job. 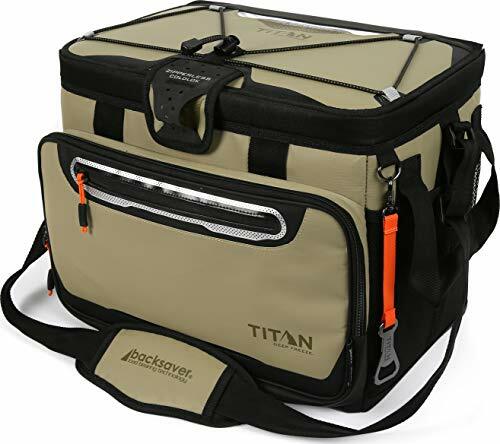 I have the Arctic Zone Titan zipperless cooler and I am happy with it, just the only thing is that it is not overly spacious and if you are planning to bring a lot of food for a picnic, you will need something with more space.